· Indonesia is a South East Asian country with a population of 238 million people. · Located between Asia and Australia, it has an area of around 1.9 million square kilometers. · It is an archipelago consisting of 17,500 islands. · It enjoys diverse, multicultural, and plural society. · The official language is Bahasa Indonesia, but the people use more than 700 local languages. · It enjoys tropical climate, rainy and dry seasons, and gorgeous landscapes. · It is a unitary presidential republic supported by 34 provinces. · It is a founding member of ASEAN and a member of G-20 major economies. The Republic of Indonesia is an archipelagic country in South East Asia comprising of at least 17,500 islands. It is a republic with an elected legislature and president upholding democratic principles. It is one of the world most populous country; it has a population of more than 230 million people, most of whom are Moslem. This country enjoys a high degree of tolerance and pluralistic life style upholding the national philosophy, Pancasila. The country shares land borders with neighboring Papua New Guinea, East Timor, and Malaysia. Other neighboring countries include Singapore, Philippines, Brunai, and Australia. Indonesia is a founding member of ASEAN and a member of G-20 major economies. The Indonesian archipelago has been an important trading region since the 7th century, when the Kingdoms of Srivijaya and later Majapahit traded with China and India. Local rulers soon absorbed foreign cultural, religious, and political models from the early times. Hindu and Buddhist Kingdoms flourished. Indonesian history has been very much influenced by foreign powers drawn to its natural resources. Muslim traders brought in Islam, and European powers fought hard to monopolize spice islands of Maluku during the age of Discovery in early 15th century. Following three and a half centuries Dutch colonialism, after the World War II, Indonesia secured its independence. Indonesian history has since been turbulent with challenges posed by natural disasters, separatism, corruption, democratization process, and periods of rapid economic change. Currently, Indonesia is a solid republic led by a democratically elected president. The central government controls thirty three provinces. Across its many islands, Indonesia consists of distinct ethnic, linguistic, and religious groups. The Javanese are the largest and therefore the most politically dominant. 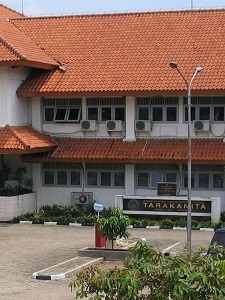 The country has gone through a number of bitter experiences, rebellions against the colonialists, religious differences, and ethnic group conflicts, before it managed to develop a shared identity defined by one national language, Bahasa Indonesia, the national motto ‘Bhineka Tunggal Ika (unity in diversity), and ‘Pancasila”, the national philosophy. This country enjoys an abundance of natural resources and a large area of rain forests that support the world’s high level of biodiversity. · Jakarta is the capital city of Indonesia populated by 9.5 million people. · It covers an area of 661 square kilometers. · It is situated to the northwest coast of Java Island. · The capital city is surrounded by Depok, Tangerang, Bogor, and Bekasi which are suburban towns inter-connected by intercity bus lines and commuter railways. During the Dutch colonialism, this city was called the Batavia. Jakarta is the capital city of Indonesia. It is the largest city of Indonesia, and the most densely populated. Located on the north coast of Java, it has an area of 66 square kilometers with a population of nearly ten million people. This city has emerged to be the country’s political, economic, and cultural capital. This is a global city surrounded by the urban areas of Bekasi, Depok, Tangerang, and Bogor. Established in the fourth century, the city became an important trading port for the Kingdom of Sunda. It was the de facto capital of the Dutch East Indies and continued being the capital city of Indonesia, after its independence in 1945. The city is the seat of ASEAN secretariat. Jakarta is served by the Sukarno-Hatta International Airport, Halim Perdanakusuma International Airport, and Tanjung Priok Harbour. It is connected by several intercity and commuter railways, and served by several bus lines running on reserved bus lines. • The institute was founded in 1968 by Sisters of Charity of St. Charles Borromeo Congregation. • It has two campuses: One is at the Billy & Moon Complex, PondoK Kelapa, East Jakarta, and the other is at Thamrin City Community Center, 6th Floor, Thamrin Boulevard, Jakarta. • It used to be a vocational training higher education center and a secretarial academy; now it has transformed into a school of communication also. • Our programs are accredited by the Directorate General of Higher Education. • It currently has approximately 733 students attending diploma and bachelor degree programs, 61 lecturers, and 47 non academic staffs. • So far it has 14,632 alumni who are mostly working as office and administrative assistants in national and multinational companies in Jakarta and other big cities around Indonesia. • The Institute enjoys industrial cooperation with 696 companies where students have opportunities to put their theoretical knowledge into practice. • Tarakanita has been particularly recognized by the industry as a producer of administrative professionals with good personality and sound codes of conduct.